The toolbox contains in total 16 different tools. Different types of tools have different purposes, thus rendering it important to understand the best approach and timing in their application to urban development projects. However, it is not always easy to see which tool or approach is the most suitable or useful in each case. Hence, the tools have been further categorised into 1) strategic approaches, 2) planning supporting tools, 3) design/ structural solutions, and 4) assessment tools. Strategic approaches and planning supporting tools aim to manage people’s behaviour rather than just large infrastructure assets. They are intended to protect the quality or limit the quantity of urban run-off and include planning, education and regulation actions. These tools work as preventive measures, since they are used before the run-off appears. Designed structural solutions are concrete structures that involve construction, moving earth and planting vegetation to reduce or delay stormwater flow and/or remove pollutants. Structural solutions are measures used after the run-off appears. The best advantage of the strategic and planning tools over the structural ones is that the former are easier to modify or stop than the latter. In addition, well-applied, strategic and planning solutions can lead to lower costs. Therefore, they should be awarded preference over structural controls. Assessment tools include evaluation criteria for stormwater management solutions and a cost benefit analysis (CBA). The evaluation criteria can be applied in the design phase or to evaluate pre-existing structures. A CBA study delivers information about structural solutions and the means by which the delivered cost and benefits can be evaluated. 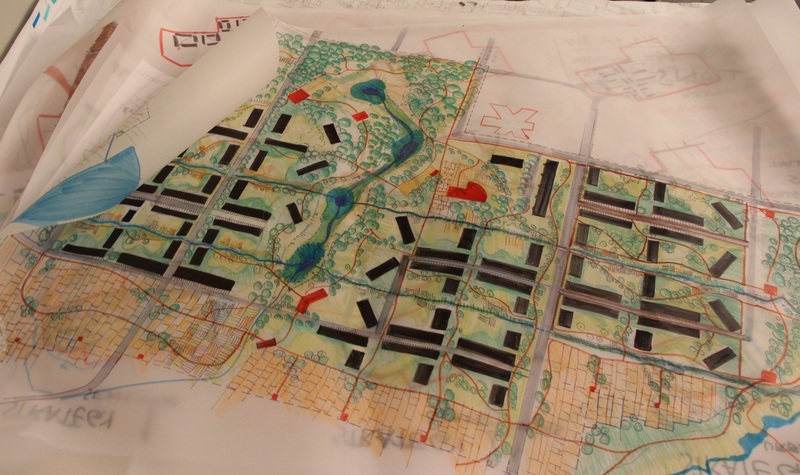 In the toolbox, all the tools are further classified into three groups which represent different domains of planning and designing integrated stormwater solutions. The three categories are based on the so-called Three Points Method, which were initially developed to provide a structure to facilitate the decision-making processes dealing with urban flood risk management (Fratini et al 2014). The initial demand to identify the different domains of actions arises from the increasing complexity of the urban context, therefore leading to a demand for help to focus on the right issues and find the correct information. The definitions of the three points have been slightly modified to be used for a practical classification of the tools. Prevention – it is of utmost importance to strenously avoid any change in the hydrological cycle and any undesirable situation, such as an increase in run-off volume, stormwater pollution, or damage to buildings and infrastructures. Under this principle, both the strategic approach and planning solutions can be found. On-source management - once the run-off appears, the use of structural solutions is needed to detain or retain it. The decentralized solutions working at the source or near the source are used in this principle. A new development should not increase run-off from the site and the water quality in surrounding watercourses should not change. If ground conditions allow, stormwater should be infiltrated on site. Centralized management – If infiltration on site is not possible, stormwater should be stored and conveyed in an open or underground structure allowing infiltration. If infiltration is not possible, stormwater can be conveyed elsewhere in order to store and purify it before entering a watercourse. A final resort is to directly drain water into a receiving watercourse. The combined approach (= the appropriate use of all types of tools) is a key element to achieving an integrated stormwater management approach and creating a multifunctional and resilient water system. Which tool is most suitable for you to use depends on how your work addresses the stormwater management. The most relevant risks or challenges concerning stormwater management in your domain (be it a region, a watershed, a block or a site) should be considered.